A lovely family home, situated on the beautiful Cheboygan River!! We are located on the Cheboygan River, which is the top end of the vast Inland Waterway going south, which is miles and miles of interconnecting lakes and rivers, offering some of the very best in Michigan boating, swimming, water skiing, and fishing. County boat launch & trailer parking just down the street at the Lincoln Bridge. Boat rentals readily available in town. The Mackinaw Bridge, gateway to the vast outdoor wonderland of the famous upper peninsula, is only a short fourteen mile scenic drive along the south shore of Lake Huron, as is the Ferry Landing to the magical old world charm of beautiful Mackinaw Island. A day trip treat the whole family will enjoy immensely. Fishing : Of the many areas to fish in Cheboygan is the Cheboygan River. Public fishing areas along the river include the DNR Dock, Cheboygan County Marina, Major City Park, Washington Park and the Cheboygan Dam. In addition, great fishing spots can be found along the Inland Waterway, Mullett Lake, Burt Lake, Black Lake and Indian River. Golf and Parks: Golf – Cheboygan Golf & Country Club,18 hole, Mullett Lake Golf & Country Club, 1096 Mullett Lake Rd. 9 hole. Gordon Turner Park – N. Huron. 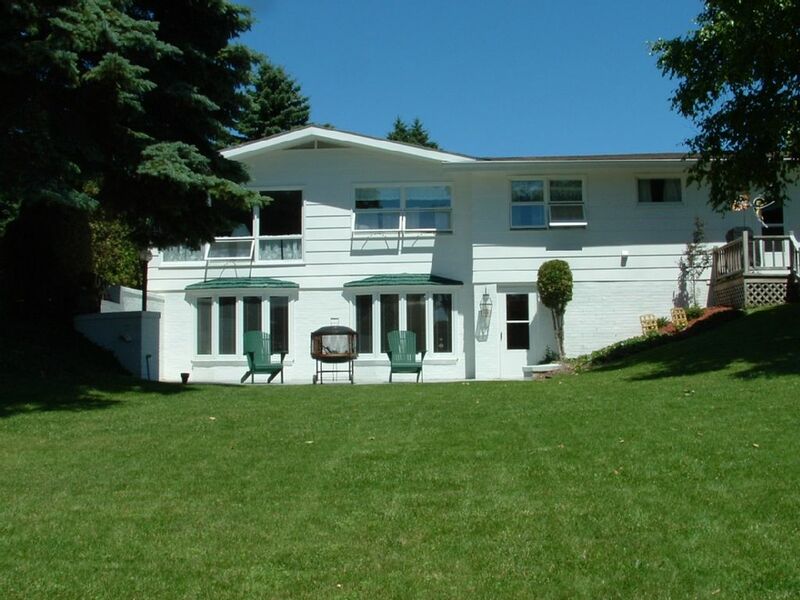 Enjoy swimming, a playground, picnics, walks along the boardwalk, the Crib Lighthouse, bird watching, soccer fields, or just take in a panoramic view of Lake Huron and the Straits of Mackinac. The Cheboygan County Marina is also located here, take a walk and enjoy looking at the boats. Town & Recreation Area: Black Mountain Forest Recreation Area – 13 miles out of Cheboygan on Twin Lakes Rd. Hunting, fishing, snowmobiling, hiking, mountain biking, horseback riding, camping, cross-country skiing, and off road vehicle trails. Downtown - Downtown Cheboygan has much to offer everyone! Whether it’s shopping, dining or strolling along the river, enjoying a summer concert, or catching one of the many Downtown events, you’ll want to make Downtown Cheboygan your destination. Beautiful place to stay over for a group of more than 10. The home has an amazing river side view. The stay was wonderful. Our group stayed here to visit the mackinaw island and up north pictured rocks and tahquamenon falls state park! The house manager was very cooperating and the owner has been very quick with response and everything. Overall it’s a perfect place to choose this home. I would definitely recommend this home! We had a great vacation. This is a very nice home with lots of room inside and out. It's perfect for big groups. The amenities and location are nice. We enjoyed spending time in the yard, on the patio, sitting on the retaining wall (?) and putting our feet in the water; and my husband even did a little fishing. We enjoyed using the firepit and the bbq. The furnishings including the beds were comfortable. The home is older and there's some wear but nothing that we found to be a problem. Of course it's a beautiful part of our beautiful state of Michigan, and there were lots of activities on both sides of the bridge. The one problem we had was the lack of air conditioning, but we knew going in that the home didn't have air, and it was August. What made it bad is that the windows are made in such a way that they don't let in a lot of air so even fans aren't as effective, so during our visit some of the bedrooms were very uncomfortable. One of our family members has Parkinson's, so we worked hard to figure out fixes. The property manager was very helpful and did her best to find solutions. She even bought some more fans and worked on the windows so that they'd open to their maximum. We ended up using one of the airbeds in the living room. My one recommendation to the owners would be to put in some window air conditioners for at least the really hottest parts of the summer (but I don't know if that could even be done with the type of windows they have). Great place for a large family or 2 families to enjoy together! Joe and Melabeth we're fantastic to work with during the rental process. Tina the property manager was great and explained everything very thoroughly and was available the entire week if we had any questions. Great location on the river close to the boat launch and close to all stores we needs throughout our stay. Our families had a great time and would recommend this place for sure! The description when we booked this house more than six months ago, said it was a four bedroom and that included an apartment with a bedroom and a second kitchen. In reality, the second kitchen was closed off and locked and there was only three bedrooms. The fourth bed was in the main part of the basement, so provided no privacy. The description also said it sleeps 12. We did not have that many but, one sofa bed was broken and the other one had springs sticking out of the mattress, so no one could sleep there, thus this house could sleep eight at the most. We were not informed of any of these issues before we arrived and felt like there was a bait and switch pulled on us. The worst thing was the house was closed up when we got there and the Refrigerator was turned off. The temperature outside was in the mid nineties and the heat in the house was oppressive. It took two days for the fridge and freezer to work and our weeks' worth of food almost spoiled. We expected no air conditioning but only half the window's would open, so there was not way to get a cross breeze into the house and the rinky fans that were provided, just blew hot air. Other maintenance issues we found upon arrival was the upper oven did not work. maybe half the light switches worked or if they did there were no light bulbs, there was peeling paint on the lower back door, the door from the kitchen to the garage slammed so hard, we thought it would fly off its hinges and there was a musty smell in the basement that never left. We rented a boat for two days and had to go to another location to get on or off because the sea wall was not stable. We made do and had a great time with our family but note to the owners, IF YOU ARE GOING TO KEEP RENTING THIS HOUSE AND YOU ARE NOT GOING TO MAINTIAN IT THEN AT LEAST BE HONEST IN THE DESCRIPTION WHEN RENTING. We are on the Cheboygan River, which is the top end of the vast Inland Waterway going south, which is miles and miles of interconnecting lakes and rivers, offering some of the very best in Michigan boating, swimming, water skiing, and fishing. County boat launch & trailer parking just down the street at the Lincoln Bridge. Boat rentals readily available in town. The Mackinaw Bridge, gateway to the vast outdoor wonderland of the famous upper peninsula, is only a short fourteen mile scenic drive along the south shore of Lake Huron, as is the Ferry Landing to the magical old world charm of beautiful Mackinaw Island. A day trip treat the whole family will enjoy immensely. Daily rental @ $300.00 (three night minimum), plus $150.00 cleaning fee & 6% tax.